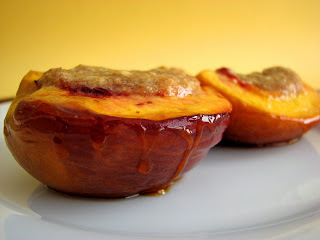 A very simple and quick way to enjoy the glory of summertime peaches is to bake them with a luscious filling. It takes very little time to put together and smells and tastes wonderful. The filling for this dessert is a simple combination of butter, nuts, cookie crumbs and some spice. Italian Amaretti cookie crumbs are perfect for a nice almond flavor, but you can use your favorite almond cookie if you aren’t able to find those. Pain d’Amande are perfect. I’ve also used gingersnaps and those are really delicious. Pick your favorite nut or spice cookie and get going. Just adjust the sugar level according to the sweetness of your cookie. Peaches are with us for just a little while longer. Enjoy every last minute of them! - Pick the best, plumpest, ripe peaches. - If you have any Muscat wine left over from the Beaume de Venise Cake, sprinkle some over the peaches before placing in the oven. - This is a great dessert served with Vanilla or Noyau Ice Cream. 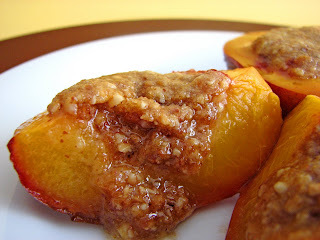 - This filling would also be great with nectarines or pears. Place the ingredients for the filling in a food processor and pulse until mixture comes together. Slice peaches in half and remove pit. If the pit indentation is small, scoop out a bit of peach. Stuff each peach half with the Almond Filling and place in a baking dish. Splash with Muscat and bake @ 350 for 15-20 minutes or until peaches are tender. 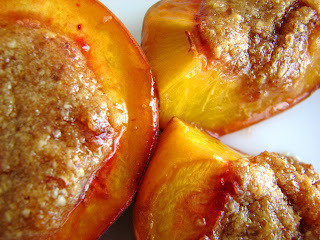 i love roasted fruits like these and then with the rich almond filling... delicious simplicity! lovely! This is a lovely dessert. I too adore roasted fruits, they are so rich and sweet. i love roasted peaches. and amretti! yum! beautiful and simple! This looks sooo delicious! Simple, yet stunning! Oh my gosh! I want to eat this NOW, but I must wait until the Saturday Farmer's Market to purchase peaches. this looks absolutely yummy! 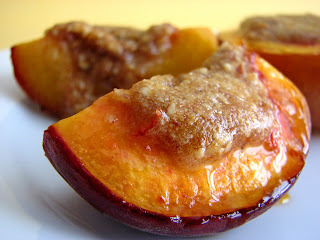 I have never tried roasted peaches before, but your simple recipe has just convinced me to try it soon. I was on the same wave length! A friend brought me a bag of peaches and I could not use them all on time so I froze them for roasted peaches this summer! That fillings looks decadent! totally made my mouth water!! These sound wonderful. Almonds, peaches and cinnamon are a match made in heaven. I'm not certain that I have ever had peaches and almonds together. Those look delicious! Roasted peaches! Wow, sounds yummy.